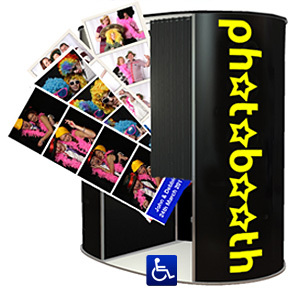 Photo Booth Hire from £199 in Leeds for Parties, Wedding Receptions, Proms and Events. Photo Booth Hire in Leeds for Wedding Receptions, Parties, Proms and Events. From our regional depots in Leeds, Manchester and Nottingham we provide photo booth hire for wedding receptions, parties, proms, Christmas parties and events in Leeds and throughout the UK. Recent parties include Leeds Plaza, Weetwood Hall, Woodlands at Morley, the Irish Centre, Bewley’s Hotel and Oulton Hall. A Dewsbury wedding at Healds Hall Hotel, in Heckmondwike hired our photobooth to compliment their wedding video with video messages. The booth proved to be so popular that the couple ended up having a separate video just for the messages. They have told us that this disc is so hilarious that it is never out of the player. We supplied the disc in a double presentaion case along side of their Wedding DVD. Photobooth hire packages available in Leeds.